The term general litigation refers to litigation and all other aspects of law which may or may not be litigious in nature such as wills/estate planning, incorporating businesses, contract drafting, real-estate transactions, disputes with administrative bodies, and more. Typically however, litigation will transpire when things go wrong and the controversay ends up in a court setting. Lawsuits are initiated by filing what is called a Complaint. There are many other procedural requirements you need to follow to obtain jurisdiction over the other party. You need to have reason to sue and typically you will have to prove your elements to a judge or jury. Depending on where you sue and the amount in controversy you may or may not be able to get discovery (i.e., get evidence including interviews and documents of other people including the other party). There are oftentimes good faith defenses to bring such as the statute of limitations. If the case does not settle, then you may have the opportunity to issue discovery to get more information. 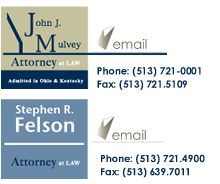 Mr. Felson and Mr. Mulvey operate independently of one another, are not partners,and are not legally responsible for each other's work. Nothing in this web site or in our informal communications creates an attorney-client relationship. An attorney-client relationship is only formed when a written agreement of representation is signed.